Now that Years & Years have rinsed their album to within an inch of its life, we need a new ampersand-utilising pop trio to lift our spirits. Stepping into the breach with impeccable timing are X&Y - aka Ben Cork, Ash Howarth and Rhys Morgan. (That's them above, Is that a big chair, or are they midgets?). Their new single Footprints is a galloping pop stomper with a rousing "HEY!" in the chorus, so people who don't know the words can pump their fists in the air and feel involved - which is great pop writing, as any fule kno. 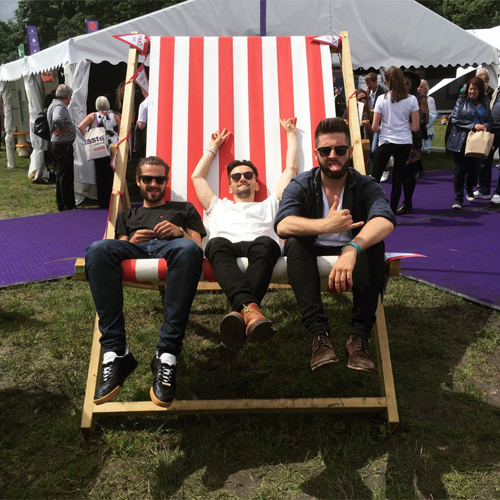 The trio support Take That at the BST festival in Hyde Park later this week. Expect to hear them on a radio near you soon.